In October, 2015 an approach I developed for space planning and programming using Dynamo was posted on the Dynamo Blog and now resides as a Use Case on the Dynamo website -- you can read about the original version in THIS BLOG POST. Since then, I have corresponded with dozens of individuals who have reached out with questions and clarifications about the workflow. As one of my earliest attempts at annotating a Dynamo definition, the flood of inquiries I received soon after pointed out some basic mishaps in the notes. In addition, the original Dynamo file was created in Dynamo 0.8.2 and the combination of new Dynamo version releases and custom package upgrades caused the occasional headache. Regardless of minor glitches and clarification, I have proudly watched as this workflow has continued to execute flawlessly over time with little to no modification and has inspired many others to adapt it to their specific needs. One of the first people to share with me how they had put this approach to work was Brian Nickel who applied it to his studies in the architecture program at Montana State University. Image courtesy of Brian Nickel. 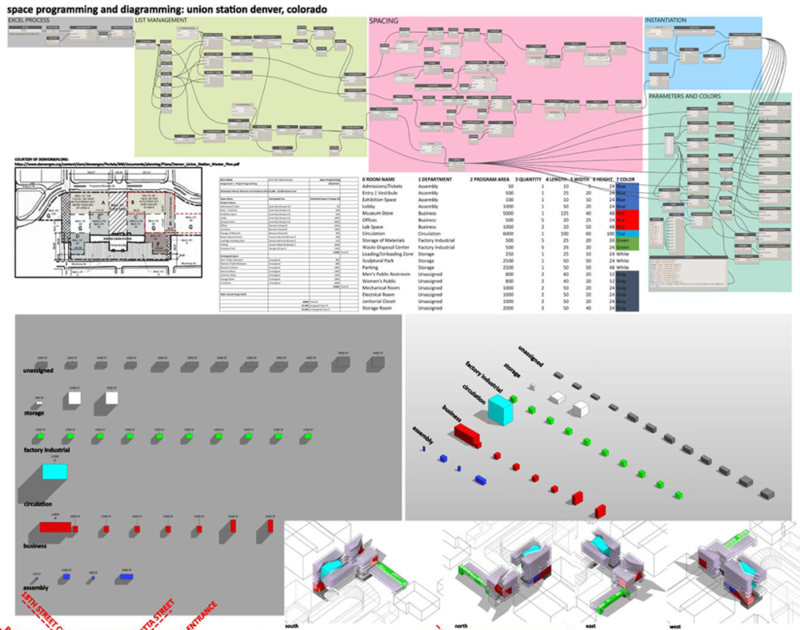 Read more about this image on his blog The Revit Saver. Nearly a year later Brian followed up with an impressive demonstration of how the same functionality in Dynamo could be piped into FormIt 360 for reshaping into architectural form. This is an excellent example of how generating massing shapes from a list of program can seamlessly begin to generate architecture without a lengthy translation process across mediums. Image courtesy of Brian Nickel. Another fantastic example of how the space planning workflow can be utilized came from Ryan Cameron who showcased the use of Flux populate the program and visualize the blocks. Image courtesy of Ryan Cameron. With the recent debut of within-node list management functions in Dynamo release 1.2.0, an update to the Space Planning definition was long overdue. Zach Kron came through with an adaptation that drastically reduced the overall number of nodes and satisfied the majority user needs with simple object spacing and an override color in view vs. material approach. Image courtesy of Zach Kron. I finally found the time to evaluate, annotate, and update the original and sample datasets can be obtained HERE. Some re-organization and general cleanup occurred but the new definition essentially functions the same way as the original. Now how could I possibly compare the number of nodes in each version to see how much more efficient the update is? I remembered that awhile ago I saw a Tweet from Andreas Dieckmann showing how to evaluate the composition of nodes used by parsing the .dyn file with Dynamo... genius! Analyzing both the original and new .dyn files reveals nearly 25% less nodes (32 total) in the new version. Parsing and comparing the two .dyn files. A sample definition can be obtained HERE. I am thankful to the always-amazing Dynamo community for your open source spirit and insatiable curiosity. I am glad the space planning definition has helped so many and I look forward to seeing people show off their future interpretations.